Hannah’s Maze of Mirrors is one of the best attractions in Branson for families and fun-seekers for all ages who want to experience a unique game through the mirrored walls. The game is to work your way through the mirrored corridors hidden inside the Castle of Savannah to save Princess Hannah from her fateful maze of mirrors. As you see the castle on Highway 76 in Branson, you’ll know that you might be lost in a modern-day fairy tale where you’ll discover 288 potential turns, hundreds of mirrored walls, and several archways where no matter which way you turn, you’ll see infinite reflections in every direction. Open 365 days a year, this unique attraction in Branson is one of the best family fun activities to do and offers easy and flexible bookings for groups. Great deals are also available with All Access Passes in other locations such as in Pigeon Forge, Tennessee; and Myrtle Beach, South Carolina. This top-rated mirror maze attraction at the Hollywood Entertainment Complex on Highway 76 Strip in Branson is perfect for families, couples, seniors, tour groups, and reunions. Hannah’s Maze of Mirrors provides visitors a unique fun adventure with engaging story and interactive experience. By participating this fun activity with the maze of mirror, you need to answer the question “Are You the Chosen One”? Then you will be given a mission to rescue Princess Hannah. The purpose of the mission will be revealed to you before you enter the maze, and the fun adventure begins as you make your way through challenging mirrored walls and archways. To find Princess Hannah, you need to team up with King Oscar, Queen Emmy, and the Wizard of the Golden Globe before time runs out. Your vacation in Branson will not be complete without visiting the Hollywood Entertainment Center as this fascinating place is also home to the Hollywood Wax Museum, Shoot for the Stars Mini-golf, and Castle of Chaos. Both of these attractions in Branson provide a unique indoor fun adventure that will give visitors of all ages with all the smiles. With this indoor adventure, you can have the opportunity to rub elbows with the stars at the Hollywood Wax Museum; a chance to become a star while playing a mini golf game; and shoot rats, bats, and zombies at the best haunted attraction of Castle of Chaos in 5D. While spending a wonderful vacation in Branson, why not avail Pick 3 Pass at the Hollywood Entertainment Center which includes admission to Hannah’s Maze of Mirrors, Hollywood Wax Museum, and the world’s first 5D Ride Castle of Chaos. You can also enjoy special rates for Shoot for the Stars Mini-Golf. 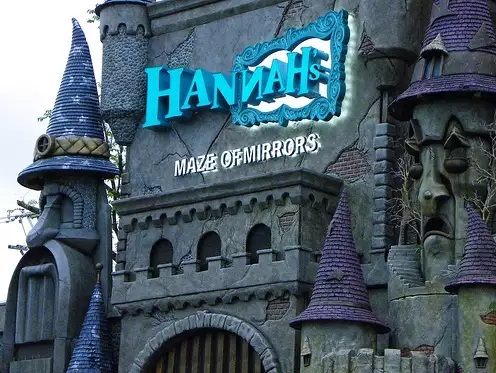 Hannah’s Maze of Mirror is truly one of a kind attraction in Branson that provides a unique indoor fun adventure to all visitors. So, if you want to experience a fascinating indoor adventure, come to Hollywood Entertainment Center and see for yourself why this is one of the best tourist attractions in Branson.